The princely name fits like a glove to Lisbon’s trendiest district. 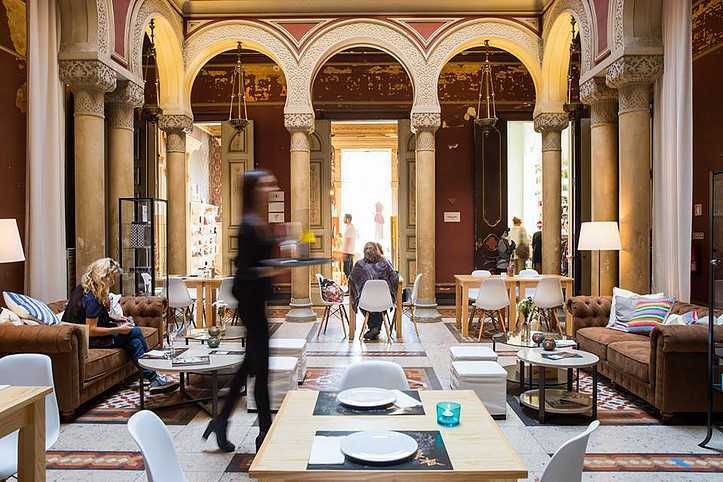 Príncipe Real, named after Queen D. Maria II’s first born, the “Royal Prince”, is the chicest district in the city, and a stylish start for your city break in Lisbon. Its natural charm and privileged location have turned it into one of the most sought-after areas to live in the city, with beautiful palaces and old buildings, lovely squares, romantic gardens and belvederes. A top-notch residential area, Príncipe Real is undergoing a curated process of transformation, becoming a dynamic center for the city’s trendiest and most exclusive shops and restaurants. EastBanc has been one of the driving forces of this inspiring renovation. Extending north of Chiado and Bairro Alto, with its select designer shops and modern food and wine temples, Príncipe Real retains the charm of 19th century Lisbon with a glorious hint of contemporariness. The ideal city break in Lisbon is a perfect mix of the past and the present of a city that reinvents itself but does not lose sight of its splendorous past. Embaixada, a contemporary shopping gallery set in a spectacular scenery, a 1800’s Neo-Moorish palace, is the first stop. It really works out as an embassy for some of the city’s smartest and most special brands in fashion and design and has a restaurant and a gin bar in the backyard. Embaixada is also the heart of a new project around Fado, hosted by EastBanc. Real Fado celebrates the soul of authentic Fado in astonishing venues of the district. The sumptuous palace’s hall and Pavilhão Chinês are just two very special, handpicked places where to enjoy an intimate, authentic experience of Fado. On the same street, Pau Brasil, a creative concept store offering the best and most exclusive Brazilian brands, is an exciting trip to the tropical “other side of the pond”. And chocolate lovers shouldn’t miss the delicious Bettina & Nicolò Corallo, chocolate makers and coffee specialists who make their bars with beans from their own plantation in São Tomé. Not far from here is Pavilhão Chinês, one of Lisbon’s most unique bars. Ring the bell and the doors will open to a cabinet of curiosities. The bar’s five rooms are decorated with an infinity of antiques and curious objects (from antique toys and miniature trains and ceramics) and the cocktails are memorable. This eclectic bar has been an icon of Lisbon since 1986, but there are new additions to the neighborhood’s food and wine scene that are definitely worth a visit. Cevicheria, led by chef Kiko Fernandes, is the place to taste the best ceviche in town, and for a sublime fish experience try Pesca, chef’s Diogo Noronha new restaurant. But this is not all: in November, the popular British chef Jamie Oliver will open a brand-new 4-storey restaurant, Jamie’s Italian in number 28, Praça do Príncipe Real. If you’re in the neighborhood, don’t miss the superb terrace bar at Hotel Memmo Princípe Real, and enjoy one of the most beautiful views of Lisbon in a contemporary, stylish atmosphere. In fact, new bars are opening every other day, such as The Bar, created by Australian-born Tereza Ruiz, who prepares the best cocktails in town. A romantic garden, designed in 1863, lies at the heart of the Principe Real district. It’s the archetypal romantic-style square, surrounded by beautiful mansions, with a café with terrace and two kiosks serving drinks. Most of the old buildings have been restored or are currently being renovated, with projects signed by renowned architects, such as Eduardo Souto de Moura (Palácio Faria). At the center of the garden, a centennial cedar wood with a generous tree top works like a green parasol. Every weekend the garden hosts an organic farmer’s market. Just a few meters down the street is the Natural History Museum, with its monumental gardens now under renovation, and its iconic palm trees that evoke Lisbon’s cross-cultural character. An homage to good taste and exclusivity, historical and trendy, Príncipe Real encapsulates the mood of Lisbon like no other district.